Every time I kinda drop the blog, people pop out of the woodwork telling me that they look at the blog every day. And I’m like… WHOOPS! I dropped the blog ball. My St. Louis sister had never actually been to the stand, so it was new to everybody! (My parents were there, too.) 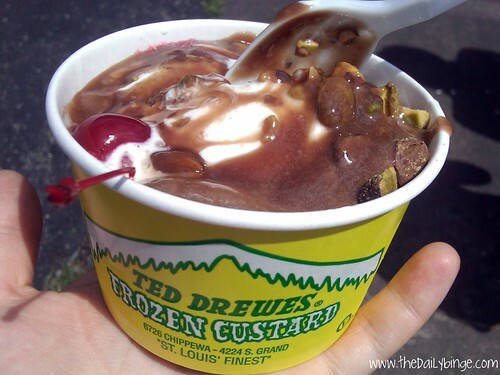 They have had some freeze-dried bulk version that they cart out at WashU (… in St. Louis– duh) on special occasions. I ordered a TerraMizzou, thinking it was going to be somewhat tiramisu-esque. I should have realized that would not be the case when I saw that the topping consisted of chocolate and pistachios, but… I like those things, too. So it was all good. You can get toppings mixed in (a “concrete”) or on top (“toppings”… just kidding– duh) (a “sundae”). 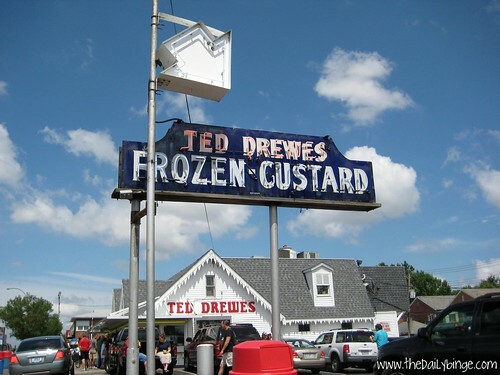 I got mine as a sundae, because I wanted to be able to taste the vanilla custard on its own, underneath. I’m not really sure if I achieved that aim, but it was all good. So St. Louis right now. My mom got some sort of apple pie concrete with real pieces of apple in it. That was also good. 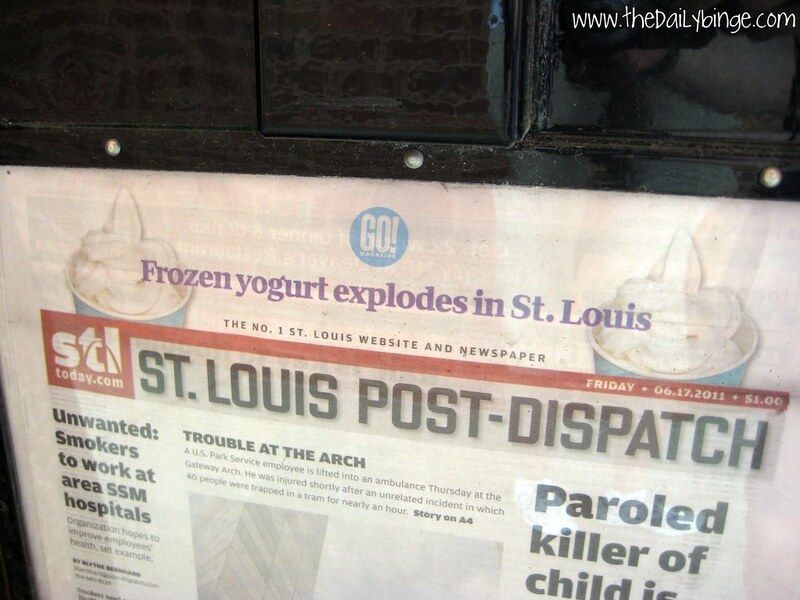 Although Ted Drewes is mega-popular, apparently yogurt had not yet “exploded” in St. Louis. We're not in LA anymore, Toto. I found the use of the word “explodes” very hilarious. Clean up on aisle St. Louis! But yeah, I guess LA really is the trend-starter. We’ve had freaking yogurt for… I mean, Pinkberry was really getting huge in 2008-ish, followed by the Yogurtland craze. And now there are a million places… it’s ubiquitous. But my family has been eating frozen yogurt rather religiously since… ever. So I’ve never really stopped to marvel at the explosion. 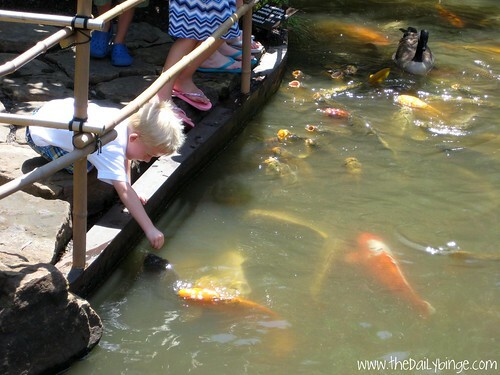 And if you are a koi fish at the MOBOT, your snack of the afternoon is little boys. Back away from the fishies. At one point I heard a splash and seriously thought the boy was a goner. Can you see those greedy, gaping mouth holes? They will haunt my dreams. This time next year, they’ll be demanding yogurt. Okay, I’m off to the Farmers’ Market! Happy Sunday– eat a sundae!